Individuals who like the clean lines and sleek, clutter-free look of a modern bathroom design have a variety of options when it comes to choosing bathroom vanities, faucets, bathtubs and accessories. Choosing a modern-style toilet is the ideal way to complete the look of a newly designed space. However, there are a few things to keep in mind when making your choice, according to NouveauBathrooms.com. First and foremost, if you're installing a new toilet into a space with existing plumbing, you'll need to know the rough in size. The most common in the U.S. is 12-inch, however 10-inch and 14-inch are also available. 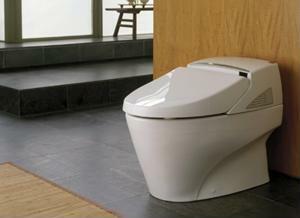 The website reports that the next considerations include flushing capacity and what type of flushing mechanism is used. "Pressure assisted toilets are the new generation and now preferred by most people in modern bathrooms," the website states. "Pressure assisted toilets are more expensive, so you need to consider this if you are on a budget." When it comes to the actual look of the toilet, consumers can choose a round or elongated bowl and a variety of colors, styles and other options.